I’ve got potty training on the brain. I know you probably don’t want to come to my site and read about potty training all the time, but I can’t help it, I’ve got “PB”, Potty Brain. Potty training really tests not only your parenting skills but your determination, consistency and patience. I can’t wait to look back and think, “Geez, I can’t believe I thought potty training was hard!” Or maybe you just think it always was. It’s hard to know when to press, when to back off. If I back off too much will my son be denied entrance into Pre-K in Fall 2009 because he still wants to wear a diaper at the ripe age of 4 1/2! Probably not because there is a strong likelihood that he will indeed be potty trained by then (cross my fingers, but still). But at the rate he is going at now, I swear, he’ll be like 12 and needing to wear a pull up to school. Okay exaggeration, but you get my drift. Anyway, we seemed to have found a break through and I can’t talk about it until I know it has stuck so I’ll tell you in a couple days. In the meantime, I need a bit of laughter, if you have anything funny about potty training to share, like a funny story. I would love to hear it, Please chime in below!!! How many accidents are too many? And is there such a thing? What do you do when your son is dry for 3 hours and then starts playing with his favorite toy and refuses and fights to get up to go to the potty? Do you drag him to the potty with every little bit of your potty training desperation ? Or do you let him wait it out and “wet” it out,over and over again? Is this all just part of the training process for him….and for me? Maybe my desire for him to potty train is not as strong as his desire to be “trained”? Or maybe that’s the problem. What do you do when the potty becomes you and your child’s worst nightmare? Look for answers on your blog ? Or maybe a sign from the Porcelain King? My son maybe a potty training late bloomer. He is completely resistant to all attempts at potty training so now my plan is to let him be and let him go when he wants to go. I don’t know what else to do. I thought he was ready, he stayed dry for long periods of time, asked to go on the potty, etc, etc, and then it all stopped. I thought maybe it was the whole pull-up action. Because it is really like just wearing a diaper. It allows you to get wet and for as long as you want to, stay wet. You can go in a pull-up and I think, or at least I thought that was the problem. So, I tried just letting him run around bare naked, but that didn’t work, George peed and pooped on the floor, and then played in it. Then I tried underwear but and he stayed dry and was successful that is until he got busy playing. I even set a timer and told him to try and go every hour, but once he began playing with his trains, there was no stopping him. I would literally have to drag him in kicking and screaming. Thomas, Percy and the gang ruled over peeing in the potty any day. So I am at a loss, I have no idea what to do. Maybe it is just the fact that he is not ready yet. My sister-in-law, whose 3 1/2 year old son just became potty trained about a week or 2 ago, agrees that George isn’t ready and insists that I wait until he is 3 1/2 and something will just click and he’ll want to go on the potty. I hope it, no let me rephrase, I wish would be that easy. Well, so that gives me 5 weeks and counting. I know every kid is different and they all develop at different rates, but quite frankly I’m not buying it. What if my son happens to be lazy at potty training and his smarts have outwitted my attempts when it comes to the P-O-T-T-Y? It’s not that fact that George doesn’t want to go on the potty. When there is nothing else to do, like at night when he doesn’t want to go to bed, or in public when he wants to see the new potty, or well…just because, he’ll stay completely dry, number one and 2. But for the most part during the day, nothing. I tried rewards and he was great. But when he didn’t want the rewards anymore he stopped going on the potty. I hope someone has some great advice, all you potty training experts out there. 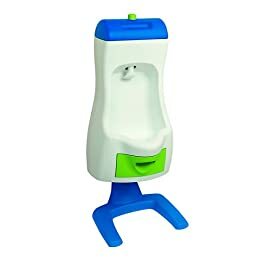 My husband always reminds me that I should expect my son to be a little late jumping on the potty training bandwagon because he was also a stubborn one. When my husband was 4 years-old my mother-in-law wondered why she hadn’t seen him go number one or number 2 for a good amount of time and then she realized he was going behind that garage with the dog. See what I have to work with! I’m not good at this potty training thing. I know there are people who are good at it. You have to be persistent, consistent and very determined. I am determined but I think I falter on the persistent and consistent. I am really good one day, as is George, and the next day I start out good and get distracted by my daughter or whatever and soon it’s been 2 hours, I haven’t asked my son to go pee-pee on the potty and his diaper is hanging like a lead weight between his legs. I should probably put on the kitchen timer. That way it remind me and him to go, but I haven’t done that. That would be too easy, right? This potty training thing is hard. It’s like a two way mind game. You have to trick them into thinking that taking breaks from playing with their ever so precious toys and getting up every 20 minutes or so to go pee pee in the potty is better than sitting in a sopping wet diaper. We see the logic, they may see it, but they don’t care. To them (my son), that is what a pull up is for, to pee in, he knows he can go pee pee in the potty and can stay dry for hours at a time, but once he gets to building his train tracks or playing outside, there is no reasoning. Especially when he senses how bad I want him to give it up. So the mind game continues, and trust me, I’ve found that the ball is always in their court. Big boys wear big boy underwear (as my friend would call it BBUs), ride bikes and go to school, big boys go pee-pee in the potty. But on the same hand big boys have learned that mommys will do anything to get them to go pee pee on the potty including giving them rewards. What if the rewards aren’t big enough for the outcome? As far as he’s concerned, his diaper can stay wet for one more day! “Mommy, I go put out fires”. This is what my son now says when he wants to go on the potty. My husband taught him to stand while peeing and “play fireman”. He told him the Cheerios are the fires and it is his job to “put the fires out”. Since my son loves firetrucks and everything to do with them, he loves “putting out fires” and went to the potty 5 times today and yesterday. I don’t know why I said fun, maybe to get your attention because I need the help! I am about to begin this potty training “adventure” with my son, now 31 months. He was going pee-pee in he potty a couple times a day until he started preschool and then everything backfired and he refused to go on the potty, so I didn’t push it. But lately I feel that he might be ready again. He holds his pee if he is in public and doesn’t want to sit in a wet diaper. He wakes up at night and wants to go to the bathroom and I am recognizing that he is starting to pay attention to the “urges” when he needs to go to the bathroom. I have no idea where to begin or what to do. There are some many different opinions out there it is making my head spin. In the meantime, I think I’ll start by taking him to the store and letting him pick out “big boy” underwear and the toilet he wants to use. I am desperate, would love to hear what has worked for others. Please share. Until then, I desperately need to do some research.